Who is Monte Creek Ranch Winery? Monte Creek Ranch Winery is a 10 minute drive east outside Kamloops City limits, and is owned by the Sidhu family. Since 2009 they have been growing their vineyards (100+ acres) and raising beef cattle. Last year they opened their Tasting Room up to the public. Beside wine and beef, you can also try all natural honey, haskap berry jam and more at the Ranch. They try to keep to organic farming methods as much as possible, which we all appreciate. I can imagine enjoying a glass of one of their red wines and a grilled steak from their grass-fed Black Angus cattle. Their website is very informative, and tells you about their ranch and vineyards, the climate and soil. A taste for adventure. I recently received bottles of their latest releases to taste and provide my opinion. One of the things that makes Monte Creek Ranch a little unique in BC is their use of the Marquette and Frontenac Gris and Frontenac Noir grapes. Perhaps you have not heard of these grapes. They are special hybrid grapes that were developed at the University of Minnesota that are able to withstand cold winter temperatures. The vitis vinifera we are well aware of, like Chardonnay and Cabernet Sauvignon, are not that hardy in cold temperatures. Remember the Polar Vortex in Central Canada and the USA 2 years ago? Many vitis vinifera grape vines suffered severe damage. The winters around Kamloops can get quite cold, so choosing to plant these hardy University of Minnesota hybrid grapes is a good idea. Monte Creek Ranch Frontenac Gris 2015 (Winery Price $14.49)- Light, bright lemon colour in the glass. Medium plus intensity on the nose with really ripe/bruised pineapple aroma. The pineapple aroma is quite strong and there are other fruity aromas in the background, but it is hard to pick them out. The wine is medium dry, with fuller body, very round and a heavy mouth feel. Lots of overripe pineapple, some candied pears, with honey and overripe red apples at the end. The lower acidity in this wine makes it a bit flabby. Maybe adding in 5% of a higher acid grape, like Sauvignon Blanc may make this wine shine? Rating: Full bodied, quite round and heavy in the mouth, with tons of pineapple on the nose and palate. Monte Creek Ranch Hands Up White 2015 (Winery Price $14.49) – 61% Frontenac Blanc, 14% Viognier, and 25% La Crescent (another Univ of Minnesota grape). A medium pear skin colour. This wine has medium intensity nose with apples of ripe apples, peaches, and pears, with some floral and candy floss notes. It is a bit off-dry with medium body, but lots of fruit flavours; mostly ripe apples and pears, but also undercurrents of tropical fruit and citrus. It is soft and round in the mouth. It finishes with peaches and pears, together with some honey, and mouth-watering acidity. Rating: A pleasant, easy sipper; fruity with flavours of apples and pears, that could be enjoyed on it’s own or with food. 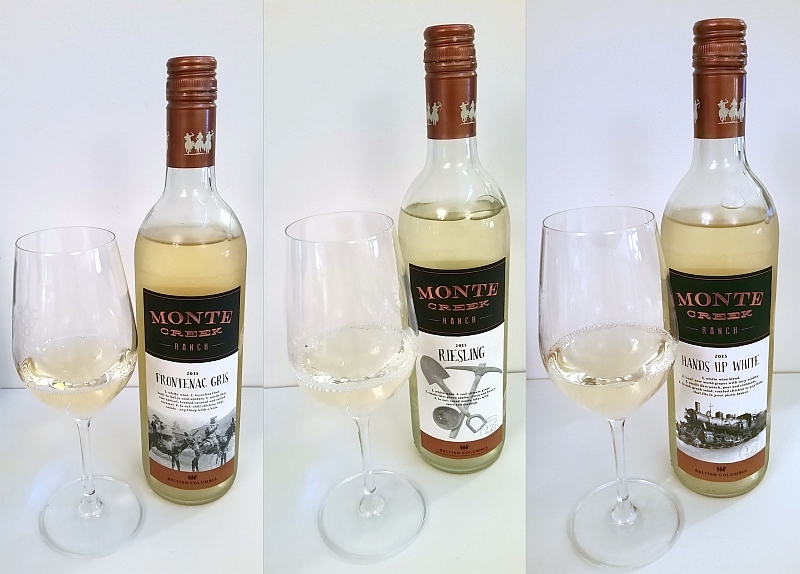 Monte Creek Ranch Riesling 2015 (Winery Price $16.99) – Youthful aromas of lime, limeade and a hint of flowers and peach. It is dry, quite round. The wine has a heavier mouth feel, but its higher level of acidity balances it out. Lime skin, together with light tropical fruit and some minerality on the palate. Some pepperiness from the mid palate to the finish. This wine does finish dry together with flavours of tropical fruit, some bitter leafiness and lime. I think that this wine will gain some complexity and interest with 2-3 years of cellaring. Rating: A young Riesling, heavier bodied with lots of lime on the nose and palate. 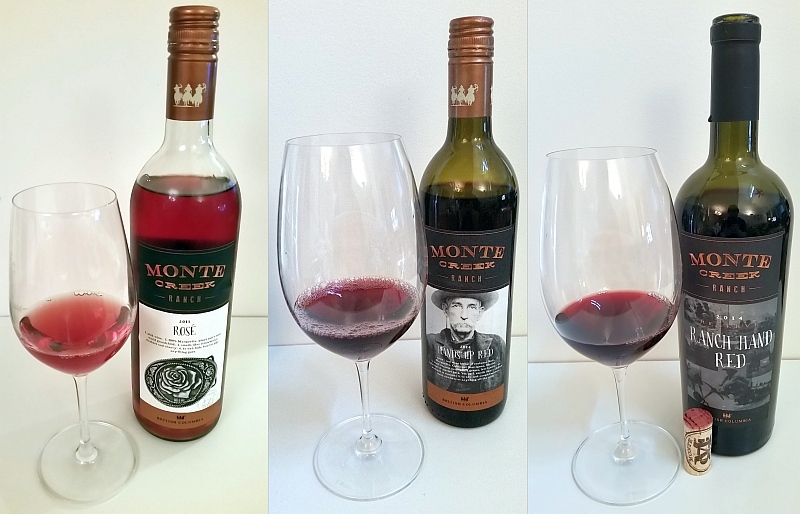 Monte Creek Ranch Rose 2015 (Winery Price $15.50) – This wine, made from the Marquette grape, is medium translucent red; a cross between candy apple and rhubarb red. It has quite a light aroma, showing red cherries and strawberries. Off dry, soft, with medium acidity and a light mouth feel. Light strawberries, red fruits, and red cherries with a hint of leafiness. Medium length with the flavours dropping off quite quickly. Rating: A straight forward rose. Pair with a salad, topped with strawberries and goat cheese. Monte Creek Hands Up Red 2014 (Winery Price $15.50) – A blend of 23% Frontenac Noir, 59% Marquette, 8% Merlot, and 10% Cabernet Sauvignon. It is medium garnet in colour. Quite aromatic wit aromas of vanilla, red fruit, sour red cherries, cocoa/smokiness, ripe cassis and nutmeg. With decanting you get some black currant leaf as well. It is dry, lighter bodied, with some roundness on the palate. Sour red cherries, ripe cassis, semi-ripe raspberries, and plums. The wine has a sour edge (rhubarb like?) along with salty minerality. Light smokiness on the palate as well. It has a medium length, finishing with cranberries, sour cherries, some bitterness and pepperiness. Rating: Sour red fruits mixed with cassis and some smokiness. Right now it is a bit too sour to sip on its own, so pair with food, or maybe give it a couple of years of age to mellow out. Monte Creek Ranch Ranch Hand Red Reserve 2014 (Winery Price $29.99) – A blend of Marquette, Merlot, Frontenac Noir, and Cabernet Sauvignon. I believe this Reserve level wine is only available at the winery. Perhaps you can order it online too. It is deep garnet in colour; much darker than the Hands Up Red. Medium intensity, youthful nose, with aromas of vanilla, ripe red & black cherries, cassis and oak. A deep, rich aroma. With decanting you get a hint of capsicum. It’s dry, medium plus body with fine tannins. Ripe cassis and raspberry flavours, along with other dark fruits, and some sweet spices. right sourness through out, as well as some salty minerality. Again with decanting you also get some capsicum on the palate. Medium length with mouth-watering acidity, pepperiness, ripe cassis, and sour cherries. Rating: A good quality wine, but is quite tart. A wine to enjoy with food, or cellar for a few years to let the acidity tone down a bit.